On February 19, 1934, a group of wives of several members of the Department met with Chief J. Arthur Mulligan for the purpose of creating a Ladies Auxiliary. This was officially approved by the Department on March 5, 1934 and the Ladies Auxiliary gathered for their first Meeting on March 12th of that year. Jane Wagner was elected as President, with Margaret R. Mulligan as Vice-President, Agnes Furman as Secretary, and Helen Breen as Treasurer. Membership requirements stated that members would be either the wife, sister, mother or daughter of a Department Member, an Exempt Department Member, Fire Commissioner or member who had passed away in good standing. The Ladies Auxiliary was to be governed by the Department’s By-Laws and would “be of aid to the firemen”. Dues were to be paid at the rate of $1.20 per year. The Ladies’ first uniform purchased in May of 1934 consisted of a white uniform dress, bow tie, swagger stick (cost of $0.10 each) and a beret. A flag and banner were also purchased. In March of the following year, it was decided to purchase a light blue cape with red lining, blue caps with a white visor, white shoes and stockings. The Ladies won a prize in every parade entered with this uniform. The cape was worn with one side thrown back dramatically displaying the red lining. One of these uniforms is on display at Headquarters and was donated by Helen Glozyga. In December of 1935, the Ladies formed a basketball team with Gladys Dickson Miller as Chairperson and Marcella Clarke O’Connell as manager. In 1939 they organized a ladies softball team with both Gladys and Marcella leading this team. At the May, 1939 Memorial Day Parade, the Ladies began the custom of distributing ice cream to all children taking part in the parade, but this was eventually cancelled due to the growth of the town over the years. During World War II, the Ladies sent packages to the Department members serving in the armed forces, and worked with the Red Cross in various capacities. At the conclusion of the War, the Department and Ladies Auxiliary held a ‘Welcome Home’ party at the Fire House. With the purchase of new capes and hats in 1953, the old uniforms were donated to a neighboring school for use by their band. In 1954, the Ladies assisted both the Brentwood and Hauppauge Ladies Auxiliaries as they organized in their respective Departments, and in 1955 they joined the New York State Auxiliary. In October of 1964, representatives from local Auxiliaries met at the West Sayville F.D. to consider the organization of the Islip Town Council of Ladies Auxiliaries. This association was eventually organized and both Irene Miller (President) and Eleanor Acker (Treasurer) both represented our Ladies as Officers of this group. In 1970 the Ladies began the distribution of Christmas gifts to geriatric residents without family at the Central Islip Psychiatric Center and for many years hosted a Thanksgiving Dinner at the Fire House for these residents. This tradition continued until the closing of the Center in the 1990’s. The Ladies have also given Science Awards and Home Economics Awards to Junior and Senior High School students. 2nd Assistant Chief Charlie Mancuso requested the assistance of the Ladies in 1975 in sponsoring a Baby Sitting Course which was made part of the Fire Prevention Program. Several hundred youngsters obtained a certificate after completing the three session course, which was conducted several times over the years. The Ladies continue to participate in the Open House festivities held every year in October as part of Fire Prevention Week. 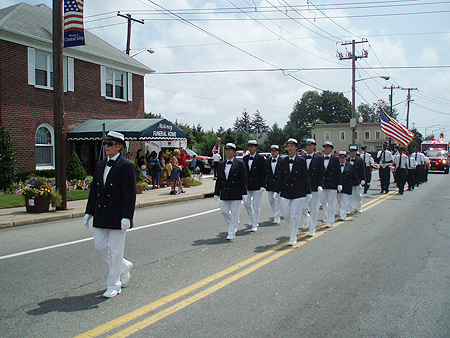 Since their inception, the Ladies Auxiliary has provided countless hours of hard work in providing refreshments (Signal #8’s) during and after alarms, assisting at the hosting of numerous parades and drills each summer (motorized, Junior drills, etc. ), and participating in local charitable endeavors. Participation in Parades continued over the years with great success, the height of which occurred in 1985 when the Ladies captured the New York State Championship at the Parade held in Nassau County (Williston Park). For a while, parade competition was halted, but began again in 2006. Their uniform has changed several times since the beginning, with a completely new style being adopted by the current marching unit. Recent Awards won by the Ladies Auxiliary were the 2007 Islip Town Championship and New York State Championship, 2008 Suffolk County Champions and the New York State Championship, 2009 Lindenhurst and Islip Town Championships, 2010 Islip Town Champions and New York State Champions, and in 2011 Islip Town Championship. The Ladies Auxiliary has been an important and integral part of the Department for over 70 years and the members of the Department are deeply grateful for their dedication and look forward to working with them for many years to come.